Fish pedicures have been a growing trend in beauty routines around the world, offering a unique spa experience to the curious travel goer. Fish pedicures have been a growing trend in beauty routines around the world, offering a unique spa experience to the curious traveller. But most who are daring enough to get a fish spa pedicure are unaware of the frightening dangers associated with this beauty service. Fish therapy, also known as a fish pedicure, involves an individual placing their feet into a tub of water that contains small fish of the species Garra rufa. Sometimes these fish are called “doctor fish” due to their ability to eat the dead skin on the individual’s feet, revealing smoother, newer skin. The act of the fish eating away at the dead skin creates a tickling sensation on the feet. The pedicure is relatively expensive, as it can cost anywhere from $30 to $100, depending on the country for approximately 200 Garra rufain the tank. The duration of the fish pedicure is limited to anywhere between 15 to 30 minutes to ensure that bleeding does not occur; however, bleeding from fish spas has been reported in the UK. Historically, these fish are native to countries in the Middle East. Garra rufa have been used in these countries for the treatment of psoriasis. One study, published in the journal Evidence Based Complementary Alternative Medicine in 2006, revealed that fish pedicures contributed to the treatment of psoriasis; however, the study was contained at an Austrian medical university and did not mimic the typical conditions of a nail salon. Despite the positive results in the treatment of psoriasis, the study does not reveal if the benefits to psoriasis outweigh the risk of infection from such a service. What Are the Risks Associated With Fish Therapy? To date, over 10 states in the United States have banned fish pedicures, according to the Centers for Disease Control and Prevention (CDC). There are varying reasons for such bans including unhygienic conditions that do not involve sanitization, increased infection risk, threatened animal and plant life, animal cruelty, etc. Although fish therapy is widely banned in the United States, the United Kingdom still offers the service legally; however, there is an advisory against it. Despite this advisory, the UK has seen a rather quick expansion in the number of facilities offering fish pedicures over the past year. Salons offering this service will claim that the pedicure is hygienic, as some will sanitize the water using ultraviolet light and heating. However, there are several troubling aspects to this usual advertisement. The water is typically not changed between sessions. Even if the water is claimed to be cleaned due to treatment with ultraviolet light, the reality is that the light does not rid the water of harmful bacteria from previous clients. An ultraviolet light strong enough to kill bacteria in the tub of water would hurt and kill the fish, which are typically not removed after each pedicure. One study published in the journal Infection reported a patient who developed methicillin-resistant Staphylococcus aureus(MRSA) after receiving a fish pedicure. MRSA, or methicillin-resistant Staphylococcus aureus,is a variant of the commonly occurring bacterium Staphylococcus aureusthat is resistant to the antibiotic methicillin, rendering it more dangerous and difficult to eliminate. Individuals who have cuts or infections on the leg or foot and undergo fish therapy can either contaminate the water by passing on the infection in the water or have the potential to acquire an infection from lingering bacteria in the water, making the condition worse. In addition, individuals with a poor immune system or poorly controlled diabetes are at an increased risk of acquiring an infection from any source including contaminated water from a fish pedicure tub, which can certainly be a high-risk situation. Some experts have claimed that there is a potential to transmit both hepatitis C and HIV, but evidence has yet to be documented. However, the Garra rufafish nibbling on the dead skin does result in the individual’s foot to bleed in the tank, indicating that skin breaks occur as a result. Although the blood and blood-borne viruses, like hepatitis C or HIV, are not likely to stay in the fishes’ mouths, if the water is not properly changed, theoretically, there is a potential for transmission of these diseases to future individuals to occur in the tank. Evidence-based and research-backed information appears to be limited in regards to fish therapy. However, the apparent significant and potential health risks outweigh the lack of documented benefits and therefore, DoveMed does not recommend engaging in fish therapy. 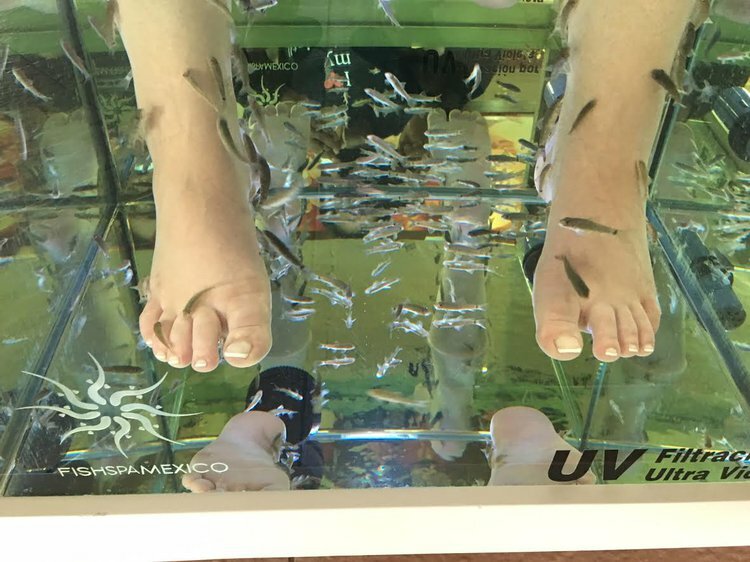 It is important to urge caution when traveling abroad to avoid pedicures that involve unhygienic conditions and especially, the Garra rufafish. Grassberger, M., & Hoch, W. (2006). Ichthyotherapy as alternative treatment for patients with psoriasis: a pilot study. Evidence-based Complementary and Alternative Medicine, 3(4), 483-488. Sugimoto, K., Frei, R., & Graber, P. (2013). Methicillin-resistant Staphylococcus aureus foot infection after fish pedicure. Infection, 41(5), 1013-1015. Garigliany, M. M., Hoffmann, B., Dive, M., Sartelet, A., Bayrou, C., Cassart, D., ... & Desmecht, D. (2012). Zoonotic disease pathogens in fish used for pedicure. Emerg Infect Dis, 18, 469-72. Ruane, N. M., Collins, E. M., Geary, M., Swords, D., Hickey, C., & Geoghegan, F. (2013). Isolation of Streptococcus agalactiae and an aquatic birnavirus from doctor fish Garra rufa L. Irish veterinary journal, 66(1), 1. Willams, L. (2012). ‘Fish pedicure’risks infection for vulnerable patients. Veraldi, S., Nazzaro, G., & Cuka, E. (2014). Staphylococcus aureus infection of the feet following fish pedicure. Infection, 42(5), 925-926. Smoker, A. (2012). A nibbling question about fish pedicures. Dermatological Nursing, 11(2), 34-37.